Sunday Hymns: O How I Love Jesus! Unlike many of the more stately hymns that I have written about in this Sunday morning series, this popular hymn lacks the majesty of lyric as well as the almost classical melody of previous favorites. Nevertheless, I find myself coming back to this simple hymn often because of the power of simple words and the appropriateness of its common tune. Frederick Whitfield (1829-1904), the author, was an English clergyman who left over thirty volumes of writings behind at his death. 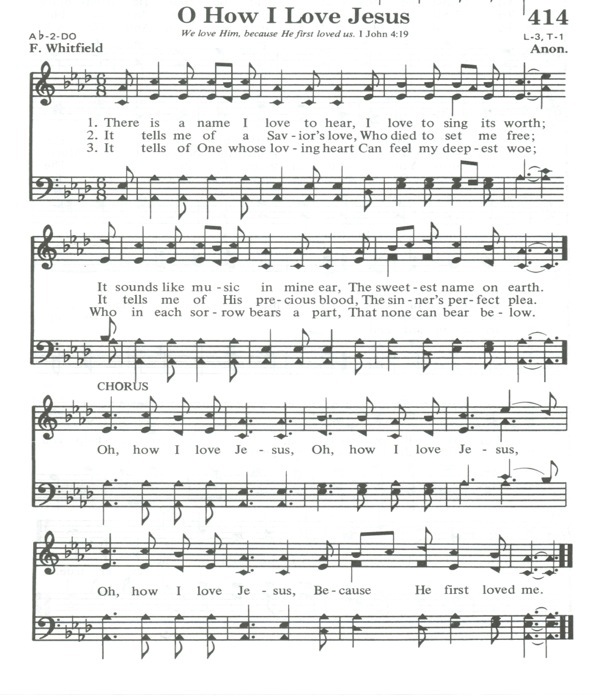 The tune is a simple American ditty; no one really knows when the lyrics and the tune came together, but by the turn of the century, it had appeared in several songbooks and was a favorite of Ira Sankey and Dwight Moody during their revivals. When Sherrylee and I first came back from Germany and I needed to earn some extra money, a young man working on his Masters degree hired me to translate a very thick 19th century German theological book into English for him. It has been so long ago that I don’t remember the exact name of the book nor its author, but I do remember how much I learned about The Name of God and Jesus. Exodus 3:15 – God also said to Moses, “Say to the Israelites, ‘The LORD, the God of your fathers—the God of Abraham, the God of Isaac and the God of Jacob—has sent me to you.’ “This is my name forever, the name you shall call me from generation to generation. Exodus 9:16 – But I have raised you up for this very purpose, that I might show you my power and that my name might be proclaimed in all the earth. 2 Samuel 7:13 – He is the one who will build a house for my Name, and I will establish the throne of his kingdom forever. I Kings 8:17 –My father David had it in his heart to build a temple for the Name of the LORD, the God of Israel. I Kings 11:36 – I will give one tribe to his son so that David my servant may always have a lamp before me in Jerusalem, the city where I chose to put my Name. Daniel 9:19 – Lord, listen! Lord, forgive! Lord, hear and act! For your sake, my God, do not delay, because your city and your people bear your Name. John 14:14 – You may ask me for anything in my name, and I will do it. Even our baptism needs the name of the Father, the Son, and the Holy Spirit (Acts 2:38). There are those who have chosen to no longer close their prayers using Jesus’ name or to call the Name of Jesus at baptism. I am not one of them! They probably are trying innocently to avoid triteness or meaningless ritual, but having been sensitized to the power, the glory, the holiness, and the eternal magnitude of the Name of God-Jesus, I could never approach his throne without The Name. And that is why I love this hymn and many more that exalt The Name. It sounds like music in mine ear, the sweetest name on earth. It tells me of His precious blood, the sinner’s perfect plea. And tho’ I tread a darksome path, yields sunshine all the way. Who in each sorrow bears a part, that none can bear below.